Bring a large pot of water to a boil, salt it, add the pasta and cook to al dente. Drain, reserving 1 cup of the pasta cooking water. While the pasta is working, in a large skillet, heat the EVOO, three turns of the pan, over medium to medium-high heat. Add the pancetta and cook until crisp, 3-4 minutes. Add the red onion, garlic and crushed red pepper and cook until softened, 3-4 minutes. Stir in the wine and cook for 1 minute, then add the tomatoes, parsley and a generous amount of salt and pepper. Cook until the tomatoes burst, 8-10 minutes. Stir in the reserved pasta cooking water and then the pasta, tossing to coat. Turn off the heat, add the basil and cheese and serve. In Recipes-list.com we have selected the most viewed recipes from category - uncategorized . Enjoy the best recipes specially selected for you! 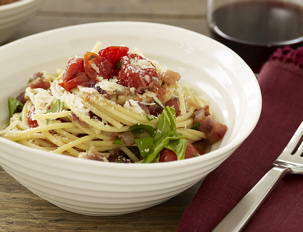 Cherry Tomato Spaghetti all’Amatriciana is the right choice that will satisfy all your claims.